EA Sports begun the development process of FIFA 17 and we expect it to be released in September, 2016. 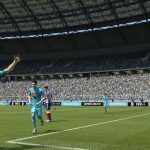 While browsing the Internet you can find information about new features to be added to FIFA 17 game but none of them seem to have reliable evidence. To be honest, some of the features, proposed by FIFA game fans are more than awesome. We gathered a list of 8 features that we thought would really be useful for the game. Take a look! The Man of the Match (MOTM) should be interviewed and receive the MOTM award during the press event. Also, managers should have a role in these media conferences. There was a partial training sessions in FIFA 16 that were used to develop the player but biggest FIFA fans want more – full training sessions in FIFA 17. An option to play as an agent would be really cool. If not adding agent mode in FIFA 17, agent at least should be used in negotiation. This feature is a MUST! Yes, please! This would be a very fun way to celebrate the victory. We mean it, EA, why there is still nothing like that in FIFA?! Also, please, make it for Women’s game in FIFA 17 version. FIFA fans are bored to play the same thing all over again and are willing to have some changes in the career mode. 8. Custom celebration and Skill maker. It would be great to have it added in FIFA 17. Have something to add to our list? Share your brilliant ideas in our comment section!